Ingalls's writing is deceptively simple--she knows how to pack a wallop into a few words. These stories are shocking, haunting, stick-to-your-ribs kind of stories. As soon as you finish reading them, you'll want to turn around and read them again. 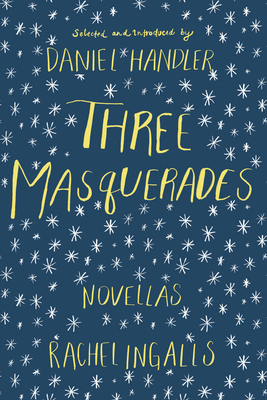 Daniel Handler assembled this collection from Rachel Ingalls' wide selection of novellas as a perfect introduction to her beguiling talent. I See a Long Journey and On Ice, novellas Mr. Handler considers basically perfect, originally appeared with a third, Blessed Art Thou, a story he considers to be in an entirely different tone. He felt that Friends in the Country from Ms. Ingalls' later collection, The End of Tragedy, was a more natural companion to the two earlier works. The author happily agreed. "Whatever their genre, the stories are wry, elegant, and terrifying. The first, I See a Long Journey--also the longest, and the best--is Edith Wharton meets Shirley Jackson... People who think they don't like horror stories are going to be very surprised." --Starred Kirkus Reviews Rachel Ingalls is an American born author who has lived in the United Kingdom since 1965. She is the author of the novels Mrs. Caliban and Binsteads' Safari as well as numerous novellas and short stories collected in various volumes including Theft, The Man Who Was Left Behind, Mediterranean Cruise, I See a Long Journey, The Pearkillers, and The End of Tragedy. Daniel Handler is the author of five novels, most recently We Are Pirates, and, as Lemony Snicket, far too many books for children.